[London, U.K., 17 November, 2011]: Huawei, a leading global information and communications technology (ICT) solutions provider, MegaFon, 2nd largest operator in Russia and long cooperation with Huawei Mobile Broadband Value Growth Solution (MBB VGS) since 2008, were both presented the "Most Innovative New Service Launch Enabled By Traffic Management" award at the Broadband Traffic Management Global Congress (BBTM) 2011 in London, hosted by Informa Telecoms & Media. BBTM's awards aim to recognize and acknowledge the contributions of global leaders in the telecom traffic management industry. The 'Most Innovative New Service Launch Enabled By Traffic Management' award recognizes telecom traffic management solutions for their leadership, innovation, and best practices in this field. Mr. Zhou Keke, Director of Consumer Service Product Line Service Delivery Platform Business Solution Design Dept. of Huawei Software & Core Network, said, "We are very honored to be the recipient of Informa's Most Innovative New Service Launch Enabled By Traffic Management Award this year. It is a recognition of MegaFon and Huawei's continuous leadership, dedication, and commitment to the traffic management industry. Huawei looks forward to working closely with Informa and with the industry to help our customers achieve business success with our world-class MBB VGS." 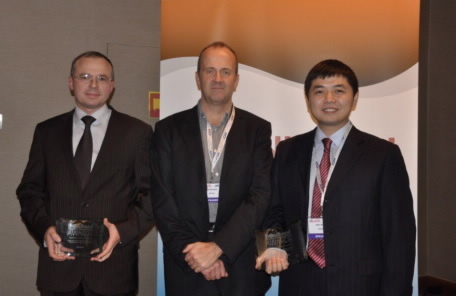 From left: Mr. Dmitry Mikhaylov, Head of Business Support System Division, MegaFon; Mr, Mark Newman, chief research officer, Informa Telecoms & Media; Mr. Zhou Keke, Director of Consumer Service SDP Business Solution Design Dept. of Huawei Software & Core Networkv Unit.